When we approach God, we often have certain expectations: for example, he should protect us and provide for us. If such expectations are not met, we feel that he is not doing his job. However, we don’t determine God’s job description – he is supremely independent. We may protest, “Isn’t he concerned about our well-being?” Certainly, he is concerned. But he pursues our well-being according to his plan, which frequently differs from ours. Our relationship with God is like a patient’s relationship with a doctor. Ultimately, the doctor and the patient share the same purpose: curing the disease. But procedurally, the cure is determined by the doctor, not the patient. The doctor determines what the patient should and shouldn’t do; that is, the doctor determines the patient’s job description, not vice versa. Gita wisdom explains that we all are spiritual beings; we are eternal parts of God, Krishna, and are meant for lasting happiness in loving harmony with him. Presently, we are infected by many disharmonious desires to find pleasure separate from him. Krishna is an expert physician who orchestrates our life to help us return to harmony. Just as a doctor sometimes uses surgery to treat the patient, Krishna sometimes uses worldly adversities surgically to disinfect us. Therefore, when adversities befall us, we need to cultivate a submissive attitude: “Krishna, how can I serve you now?” Just by shifting our consciousness from the problem to Krishna, we will feel some relief. Thereafter, the resulting calmness will make us more receptive to his guidance about how to best face that situation. By maintaining a steady service attitude, we will grow through upheavals towards spiritual health and happiness. 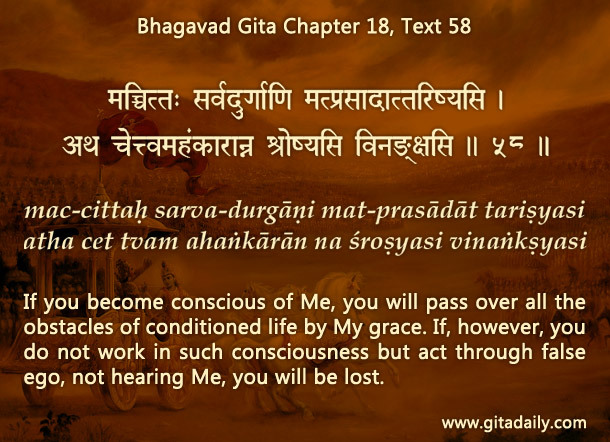 Thus, we will realize the truth of the Bhagavad-gita’s assurance (18.58) that when we become conscious of Krishna, his grace takes us through all obstacles. Hare Krishna prabhu . Thank you so much for beautiful meaning.